Food Day: Are You Food Literate? Dietary changes have been coming a little earlier for many people who make New Year’s resolutions since 2011. That was the year that the Center for Science in the Public Interest (CSPI) started Food Day, an annual movement that occurs on Oct. 24 and is aimed at improving American diets and food policies. More than one-third of U.S. adults are obese, and the medical costs of this health condition add up to billions, according to the Centers for Disease Control. 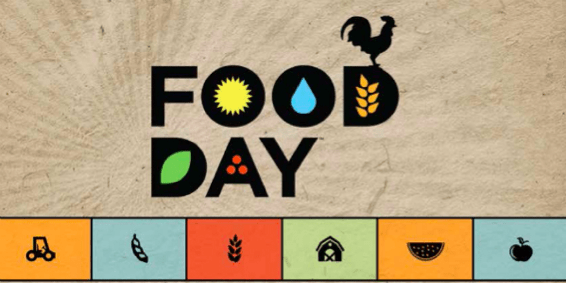 The creators of Food Day hope to combat obesity and make more people aware of their daily food choices. From coast to coast, Food Day gets people of all demographics involved in the celebration of “food literacy.” The CSPI defines food literacy as understanding the story of one’s food, from farm to table and back to the soil; the knowledge and ability to make informed choices that support one’s health, community and the environment.” This idea celebrates and prioritizes real food as opposed to the highly consumed processed foods that have taken over grocery store aisles. Food Day’s activities include an online Food Literacy Quiz, which offers facts varying from how to identify organic produce to how to read nutrition labels correctly. In addition to the quiz, Internet-savvy people can join @FoodDay2014 for a live Twitter chat under the #FoodDayChat hashtag. The conversation will cover five topics in five hours from noon to 5 p.m. ET), including insights and information on food justice, policy, public health and more. Social media users can also participate in the #FoodDayPlate contest by sharing pictures of their healthy meals under the hashtag. For those who like to get a little more hands-on, thousands of events are happening across the nation that address things like access to healthy food, the treatment of farm workers, and recipe and regimen exchanges. People can find nearby events by inputting their Zip codes into the Food Day national map. Food Day is encouraging people to get ahead on a healthier lifestyle and better eating habits instead of waiting until New Year’s Day. Diona Humes-Jamison is a food reporter for 101Magazine.net.